Courtiers are non-combat units who serve various supporting roles for their side. They are traditionally used as servants and entertainers, though courtiers may act as advisors, politicians, and diplomats, aiding those rulers who lack those abilities. There seem to be many subtypes and roles for courtiers. Jesters traditionally act the fool at court, use Rhymeomancy to create satyrical songs, and juggle or perform other acts to entertain (and mock) their ruler and other members of the court and visitors.WB2014 Lord Crush - Part 4 Manservants and maids serve tea, help higher ranking units dress, clean personal apartments, and serve food. Scribes and record keepers maintain documentation about things like crop yields and finances. There may be other subtypes that are as yet unseen. Bucky Bits, Chief of staff to Homekey. Dunkin McClown, jester to Squashcourt. These are some of the roles or functions Courtiers have been seen to do. Courtiers may be able to manage cities in place of warlords. Don King's observation that using warlords instead of courtiers was "a risky extravagance" suggests that courtiers may be significantly cheaper to pop and have lower upkeep than Warlords who are more useful directing battles in the field. It is possible that Warlords provide a larger efficiency boost to their city than a courtier (to make up for the higher expense) but may have questionable strategic valueErf-b1.5-p035 when the city is not under siege. They may make suggestions on what units to pop, where to spend money, whether to ally with other sides, etc. In this way they may act as a sort of friendly "A.I. "; in some strategy games, the computer can handle basic maintenance for you. Non-royal sides can use courtiers, but they seem to do so far less often than royals. Before book 2, everyone in Erfworld was a combatant; no one even had a concept for "civilians" as Parson understood it. 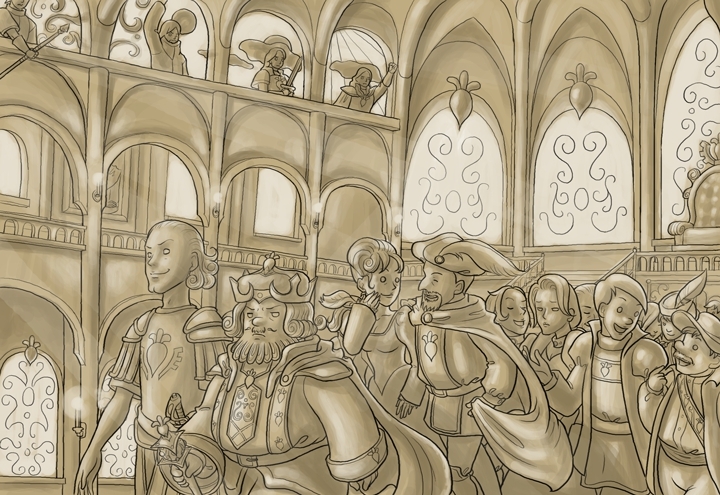 Being non-combatants means courtiers may be the closest Erfworld has to civilians. This page was last edited on 7 February 2017, at 05:14.